Combining a ladderback style with a modern appeal, the Amish Bellagio Dining Room Chair offers a stylish, comfortable design for your dining room furniture collection. 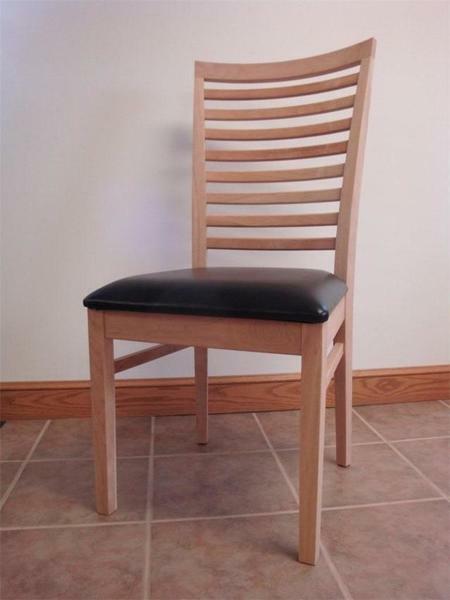 A ladderback dining chair is a popular style, providing ample back support with the solid wood and construction of the chair back on display. The strong lines and smooth form of the Bellagio indicate a more modern look, combining the best of both worlds for your dining room furniture collection. These Amish dining chairs are completely customizable. Handcrafted in America by skilled Amish artisans, each chair is built with a strength and durability that ensures its usefulness for decades. Visit our helpful blog post, "DutchCrafters Ultimate Guide to Choosing the Perfect Dining Room Chair," for dining chair information. Consider our Bellagio Bar Stools for a pub height table or kitchen counter. Speak with an Amish Furniture Specialist today at 866-272-6773 with any questions you may have or visit our DutchCrafters Furniture Store in Sarasota, Florida to experience our Amish furniture in person. I want to thank everyone at Dutch Crafters for a beautiful table. We are now done with our design project and want to share a picture with you to show just how awesome this table looks in our home. We love all of the pieces we got and are excited to do business with you again in the future. We wanted to let you know that we received our new dining room table and 6 chairs and that your company and craftsman exceeded our expectations. The packaging was excellent and it was delivered to our garage with no damage. We were apprehensive about ordering such an expensive unseen item but after talking with Linse Miller and checking with the Better Business Bureau we decided to order our set. My wife and I have been looking in local stores for several months but never found anything like what we saw online at the Ducthcrafters web site. After unpacking and setting it up, we then inspected it very closely. I am a precision machinist and my wife used to be an inspector for a large precision instrument company. We both couldn't find any flaws and were very impressed with the quality of the furniture. Every time we walk into the room where the table is, we find ourselves admiring the craftsmanship and quality of this solid maple dining set as if it was a center piece of art. We would like to thank everyone at JMX that helped us find the perfect dining room set. Please pass this on to the craftsman and workers who built and prepared this order with our greatest appreciation for their quality work.